Featuring ten anecdotes about Torontonians across the inner suburbs who recount their lived experiences, the article proceeds to present a narrative of our city which typecasts the residents of the downtown core as the haves, and those of the inner suburbs as the have nots. In other words, it not only lumped the former municipalities of Etobicoke, Scarborough, East York, and North York into one general category; it also stigmatized all these neighbourhoods as low-income spaces grappling with gun violence, crumbling infrastructure and immigrant struggle. Some of these stories offer cautionary tales about the personal impact that bad decisions or the precariousness of the menial end of the job market, can have. Others recount the trials and tribulations of building community in areas like Dixon, Jane/Finch, and Lawrence Heights – all areas plagued by gun violence. While these stories should celebrate the resiliency of leaders in those communities, they instead depict the inner suburbs as helpless, victimized, and in need of charity. We need to be mindful of how we frame these narratives since the language we choose evokes a particular framework. Those perspectives in turn shapes how we think about our city and the specific experiences of certain communities. While I laud Toronto Life for taking an interest in the plight of those who live across the subway track, the magazine told the story in a way that feeds directly into the familiar media narrative about the inner suburbs, and which Toronto Life claimed it wanted to avoid: vertical poverty, under-resourced schools, immigrant struggle and gang warfare. Is Toronto responsible for the over-crowded schools that resulted from Mike Harris era cuts to education, and which have yet to be replenished by the Liberal government? Did Toronto fail to ensure the safety of these neighbourhoods, or are gangs a symptom of the high youth unemployment? Who is failing whom? Is Toronto Life saying we should ‘fix’ the inner suburbs in order to avoid social unrest? This kind of alarmist rhetoric merely undermines the capacity of the inner suburbs. Rather, we should seek to remedy inequitable access to opportunity and mobility within our city because people deserve better regardless of their social status, income, and neighbourhood, not out of fear of what they may do, if we don’t. We need to stop talking about Toronto’s inner suburbs as if they were monolithic and interchangeable. The neighbourhoods in these former municipalities are as economically diverse and disparate in lived experiences as those in any other city. The inner suburbs, just like the downtown core, are complex spaces comprised of countless overlapping stories. For example, Rexdale is often portrayed as a community plagued by gun violence and poverty. 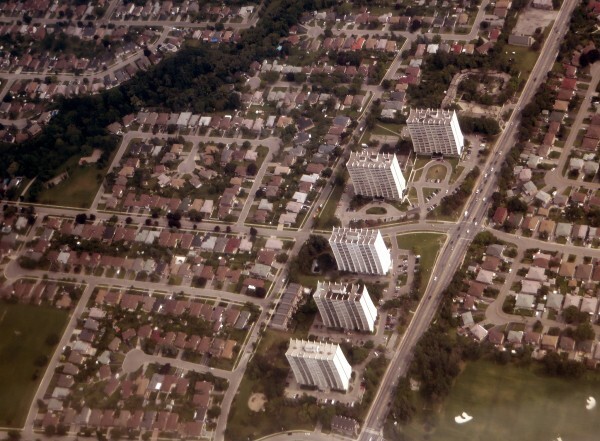 But it is a diverse area that encompasses neighbourhoods such as Smithfield, which has one of the largest concentrations of subsidized housing in Toronto, as well the historic village of Thistletown, which is comprised of cottages built in the early 1900s and the post-war bungalows of The Elms. The danger of the single story, as novelist Chimamanda Adichie wrote, is that “they show a people as one thing, as only one thing, over and over again and that is what they become.” The singular narrative of Toronto’s inner suburbs, as places plagued by violence and poverty, is one that risks critical misunderstanding. Excellent… from now on we’ll laud West North York and North Etobicoke as unmitigated success stories. These aren’t neighbourhoods with demographics that need attention and help… they are pinnacles of achievement, that we should all strive to model. Good government and charity aren’t the solution… they’re the problem! The violence and apparent sociopathy coming out of these neighbourhoods is very real, and very dangerous for the city as a whole. Arguing with the messenger instead of fighting the stereotypes is useless. Why were so many of those profiled in #TorontoIsFailingMe Sri Lankan or Somali? It’s not Toronto, it’s income inequality that has failed many of these people. You can find the same stories all over North America where cities all follow the same fashions in politics and architecture. Richard: you’re wrong about shooting the messenger. How we talk about the city, and the inner suburbs, is vitally important. If you don’t think so you’re part of the problem. But your sarcasm also validates Idil’s thesis: Willowdale, Bayview Village, Malvern, Markland Wood, etc are places within our inner suburbs that are doing very well. The entirety of North York, Etobiocke, and Scarborough are not down in the dumps and many people love living there. Toronto Life seemed to ignore this. With respect, Richard, I think you’re missing Idil’s point. Judging from the obvious sarcasm in your first paragraph, you appear to be reading something into her argument that simply isn’t there. What I’m getting from this is a warning against simplistic narratives reducing the inner suburbs to dysfunctional hellholes that contrast neatly with the downtown shinyshiny. In other words, she’s arguing against the stereotypes that you condemn in your last sentence — and rightly calling the messenger to account for perpetuating those stereotypes. The irony there being the reelection of the former Councilor for Ward 2 despite the lack of support he has given to all of the people he is supposed to represent in council. But then, many of these politicians are elected because not everyone has the opportunity to (or makes the choice to) vote and because of the first past the post systen that lets a councilor win with as little as 20% of the vote. Another issue is the lack of local democracy and access to city hall. Basically each Community Council would have 3 councilors elected by ranked ballots. These 36 councilors plus the mayor would be the General Council for the City of Toronto. Each of the 3 councilors would also select one councilor from among themselves to represent their Community Council on a 13 member Executive. City Staff and General Council and the Executive could handle most issues as they do today but planning decisions and local services would be managed at community council. Increasing the number of community councils from 4 to 12 brings decision making back to the local level and let’s the Executive focus on broad city needs rather than the wishes of the mayor. A slightly smaller council (36+1 rather than 44+1) means more efficient and effective debate. Finally, a ranked ballot system and shared responsibilities for Community Council means a reduced chance to have political fiefdoms or long serving councilors who do little for the people they are supposed to be representing. I also suggest that the TDSB needs to be broken down into 2 separate school boards (basically North and South) to create more effective and more democratic representation and better governance…but that is another topic. Well said, Idil! I agree 100%! (But yes, giving credit that at least a variety of perspectives are finally shown in Toronto Life.) The complexity and humanity of the various achievements AND struggles of immigrants & refugees living in the ‘burbs need to shown. Why is media trying to equate suburbs with all negative? I can’t stand these simplified characterizations. Not wholly truthful, inspiring, or fair. Excellent writing. It remains a shame that Idil Burale is not on City Council. Where the Toronto Life piece fails is when it conflates geography and poverty. Low income communities are struggling everywhere in and out of Toronto. As for this city; is the poverty of north Etobicoke any better or worse than poverty in the downtown core? it’s not a helpful question. It’s kind of like debating what hurts more a broken arm or a broken leg. Poverty is a bad thing. Addressing it requires a lot of work. Much of that work is being done by low income families already. The article positions this as survival, but read the article again. Person after person is not simply satisfied with solving “their” problem. Virtually everyone profiled is engaged and working with a larger community to tackle some big issues. While this gives rise to hope that things might get better. They would certainly improve if we all tackled income inequality, precarious employment, a punishing immigration system, not to mention understanding how racism and discrimination makes all of it worse. Toronto isnt failing them. Indifference is. and indifference is not defined or produced by geography. I have to agree with Adam. When it comes to jobs, cities can influence their location but not their existence. The federal government has the most influence in that regard. Perhaps Adam could use his position as an MP to end Canada’s participation in TPP. Toronto’s white elites seem to take a voyeuristic delight in decrying the rot they perceive in the old suburbs. Toronto life, the magazine that once theyput a sensationalist picture of Aqsa Parvez on the cover to juice up sales, is probably the worst of the bunch. The counternarrative that the inner elites don’t tell themselves: That north etobicoke etc are affordable, stable, and comfortable places to live a traditional Canadian lifestyle (bungalow and a car); and that the problem faced there are caused by economic policies championed by the inner elites (densification, lrt, etc) that have driven up property values and clogged the city. Must nitpick here and note that you forgot about the former city of York when you listed the inner suburbs of Toronto. No slight meant I’m sure but you may want to correct that.